Day 1197 - Happy Birthday, Stephanie! Today is my sister in law, Stephanie's birthday. I did put a card in the mail but it might be a day late and a dollar short. 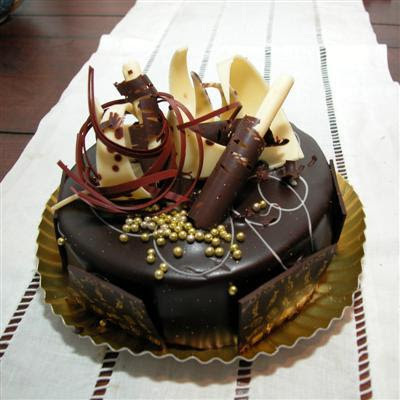 I grabbed this cake photo off the internet - doesn't it look DELICIOUS? I'll make this short so I can go back to visiting around the kitchen table with Cheryl and Charlie. Cheryl goes back to Providence tonight - she's already done her checkin and printed her boarding pass. Day 1196 - Cheryl's here! Here is a picture of Savannah trying on my fanny pack... Doesn't quite fit yet. Cheryl is here and we are having a great weekend already. Thanks, Charlie for picking Cheryl up at the airport and entertaining her until I finally got out of work (half an hour late). I had intended to leave early. Oh, well. Last night for dinner we had grilled trout (that Charlie caught) with lemon pepper, spinach pie, cauliflower, and sauteed mushrooms and vidalias. We watched two movies - 'Stargate Continuum', and 'Journey to the Center of the Earth'. Later that evening we had fresh watermelon, pineapple and kiwi fruit, and even later I got out the dark chocolate M&Ms. YUM-O! Today is shopping at Opry Mills and more movie time - not sure what we're going to go see yet. Day 1195 - Cheryl's on the way! 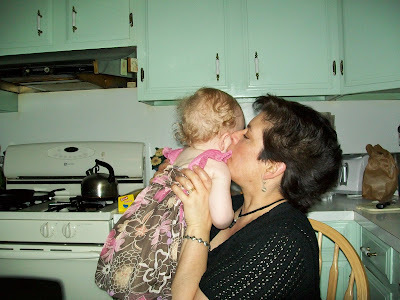 Cheryl is coming to visit for the weekend - here she is, giving Savannah a smooch. A Coworker has a 3-year old son. He was saying that his 3-year old doesn't really remember last summer when he was just 2. His son had LOVED going to the beach last year, but didn't remember it this year when it was mentioned how much he liked it. His son was confused that he is being dressed in short sleeved shirts, because all he remembers through the winter is that his sleeves are 'supposed' to be long! He thinks something is wrong with his clothes! Too funny. I think that is SOOOO interesting. Have a great day and a great weekend! TTFN! It's my mother's birthday today! Do I have to pay royalties if I write the lyrics and don't sing it out loud? Here's a funny story (on me) that should bring a smile- or grimace - to your faces. Yesterday, Charlie and I went out for dinner at Chilis. We sat in the bar section, where the music was a little loud, but not TOO obnoxious. Charlie was telling me about one of his fellow beekeepers. Charlie said 'He has a home remodeling business. Most of his work is in Brentwood'. I heard 'He has a home embalming business. Most of his work is in Brentwood'. We'll laugh about that for a LONG time to come. Happy Birthday, Mom! Hope you opened your birthday cards! This is one of my favorite photos from Roger Williams Park Zoo. 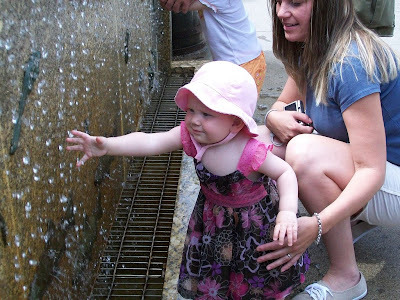 Savannah enjoyed reaching over to try and 'grab' the water cascading down the wall. The little girl you see at the back of the photo came over at one point and stood very close to Savi, first patting Savannah, then reaching right next to her for the water. Savannah wanted her personal space - and grabbed the little girls arm to MOVE her away. It was hilarious. Her father (who was grinning) said gently - 'There's room for everyone' or something like that. There are mosaic fish 'swimming' on the wall, by the way - it's really a pretty and fun exhibit. Here's a cute picture from Memorial Weekend. 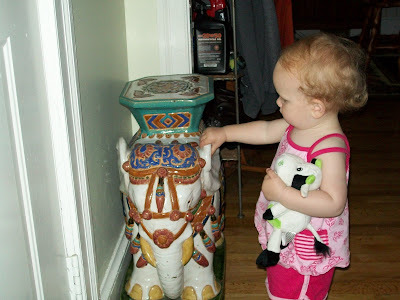 Savi is checking out the big, porcelain garden elephant at my sisters house, while she is holding the little cow my mother brought her. Cute! There was a delay before we could get on the flight. Nobody ever posted 'delayed' on the board or told us WHY the plane was delayed, but somehow the word went around that something was getting fixed on the plane. Security agents used that extra time to do spot searches of bag contents of those standing in line - including me... Hey - if they WANT to look through MY pocketbook and sort through tampons and such - go for it. When we finally started boarding half an hour after the plane should have departed. I found a seat on the aisle and stowed my purse and carryon under my seat. Maybe half the plane had boarded, and an annoucement was made that we had to DEPLANE and take all our things with us due to a security issue. They herded us into the jetbridge (talk about claustrophobia) and we stood there for a while. Then they herded us into the lobby at the gate for a while. There were all sorts of agents, police, sniffing dogs, etc. in the lobby, discussing whether we had to be marched down to security for rescreening. Then they herded us out into the main corridor, flanked on both sides by security agents. They parked us in front of the restroom, and nobody could go IN or OUT of the restroom. We stayed there for a while, and someone figured out that WE weren't the problem and they put us all back on the plane, no boarding groups, as they had already collected our boarding passes so they had to check each ID as people got on. I got to Nashville two hours late. What was the deal? If I understood this right- mechanics fixed a wind screen on the plane, brought the plane to the gate, and then went inside for lunch, unescorted. That was the breach. Gotta go to work! TTFN! Day 1191 - Happy Memorial Day! 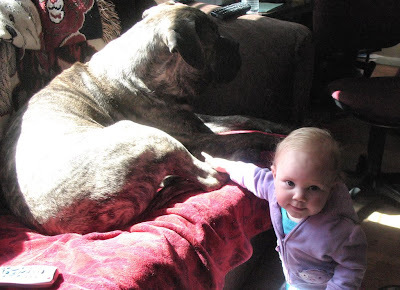 Here is a cute picture of Little Savi with BIG dog - look at the expression on her face as she is pointing at the dog. Savi enjoyed watching birds and squirrels out the window yesterday at my sister and brother-in-laws. 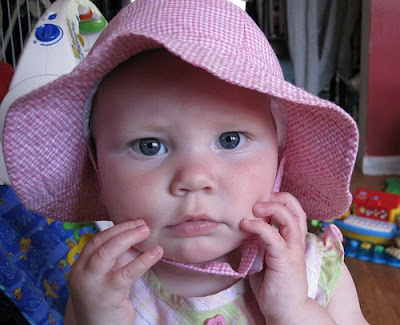 She chatters away in her own baby language (some of which we THINK we understand). 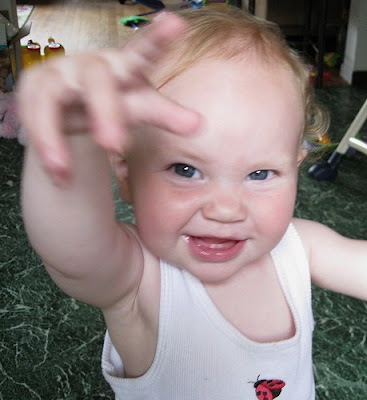 I heard 'twinkle twinkle little star' yesterday, and we also did the 'itsy bitsy spider'. Well - it is Memorial Day, and I will be heading to the airport a little later to return to Tennessee. Bye, everyone! I had a wonderful time and can't wait to come back! Thank you to all the Service men and women out there who give their lives to keep our country safe. I didn't know that the origin of Memorial Day goes back to the Civil war. We had another great day yesterday, and got to see Heather and Savi, Mike, Cheryl, Evan, Christopher, and more! Savi got to eat the 'Elmo' cupcake Cheryl bought her, and 'slimed' as many people as possible with icing. She has felt very comfortable at the house, and liked watching Steve grill through the kitchen screen door. Thanks to 'Bro-in-law' for cooking hot dogs, hamburgers, and pork chops for the crew. They were just wonderful! Another day of visiting today, then tomorrow I'll be heading back to Tennessee. I need to remember to do my online checkin this morning! Greetings, Memorial Weekenders (day 2)! First - thanks to Heather and family for my Mothers Day gift - a new 9.2 megapixel camera with zoom lens! I've been wanting a better camera, but was waiting for my other one to wear out! I've already taken a bunch of pictures (no surprise there). 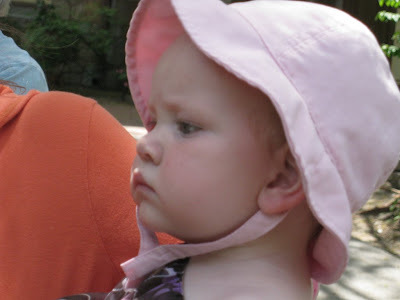 Here is a sweet picture of Miss Savannah at Roger Williams Park Zoo - our outing yesterday. We had the best day, seeing elephants, giraffes, camels, seals, birds, and lots more. It was an unseasonably hot day near 90 degrees, but thankfully the shade was pleasant and there was a breeze. 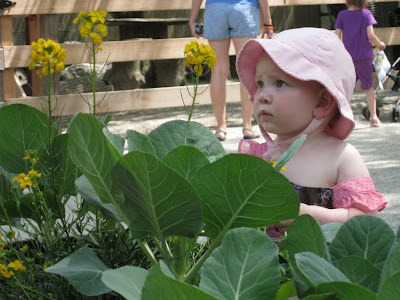 Savannah really looked at the animals and paid attention. She was tired at the end of the trip but didn't fall asleep - there was so much to see! She would wave at the animals and say 'Hi'. 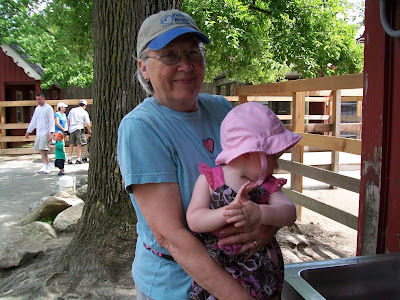 She got to pet a goat in the 'Barnyard' section. It tried to eat her dress, and I had to pull the dress out of it's mouth! I can't describ e how much she has changed since March, she is more independent, more vocal, and has more attitude! Too adorable for words. Today - more fun and a cookout! It's cooler too, which is a good thing. TTFN! Day 1188 - I'm here!! Yesterday, the moon was NOT in alignment for me! I put my watch on, so I could use it while my phone was turned off in-flight. I rarely wear my watch anymore because I use my cell phone as my clock. Then I noticed the battery had worn out, and the watch was useless. I dropped it in my purse. I left work, headed for the airport and drove a number of miles before I realized MY CELL PHONE WAS MISSING! I pulled over on the highway, took out my blackberry, and emailed my team at work. They found my cell phone, and I drove to the next exit, turned around, drove BACK to work, got my phone, and started AGAIN to the airport. I was hungry, and ordered a mango smoothie at an airport food place. The attendant rang up my order wrong the first time (I had ordered a protein add-in and he didn't ring that up). Once we resolved the order, he put mango juice and half a banana in the blender carafe, then turned to fill a cup with frozen 'smoothie stuff'. Nothing came out. I waited. He went in the back and returned with another employee. Nothing. I settled for a roast beef sandwich, WAY different from a mango-smoothie-with-protein-shot. My flight ended up being 45 minutes late. The airline people never made an annoucement after delaying the flight 15 minutes, then 20 minutes. WHAT-EVER. My son was waiting for me at the airport. My bag came out promptly. My point is - I am HERE, safe and sound, eating bagels, and looking forward to spending the weekend with the FAM! Day 1187 - Hooray! Vacation is here! It is 'Memorial Weekend Eve', and all is well. Time to go to New England to see 'the FAM'. Here's a cute photo of Savi before I go take a bunch more this weekend. 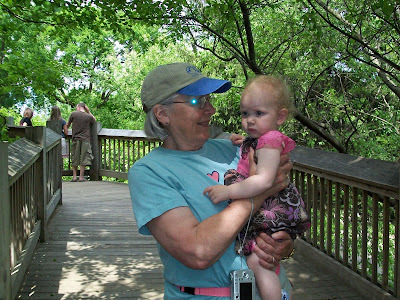 The FAM I will visit with includes children, grandchildren, mother, sister, brother in law, as well as friends. I will also enjoy having a long weekend - with a vacation day and a holiday monday. Bliss. Actually, I'm not traveling until after work today, but since I need to bring my suitcase 'n stuff to work, I feel like I'm leaving this morning. My mother will also arrive today from Maine, and we'll meet up tonight at my sister and brother-in-laws. TTFN and I'll blog at ya from there tomorrow! Day 1186 - Typecast, or busted? It is almost time to go on vacation! Charlie is going to do the airport online checkin for me, because I won't be home. Heather, Savi, Evan, Mom, Lyn and Steve - I'll be there tomorrow night! 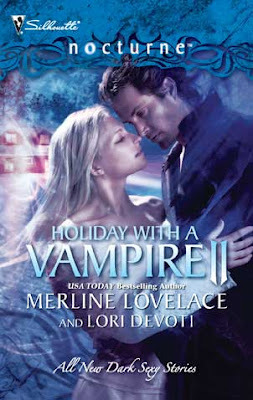 Amazon.com sent me an email announcement that they have a new 'paranormal romance' section. Hmmmm - what does that say about MY buying habits? Does that mean I am not normal - that I am para-normal? 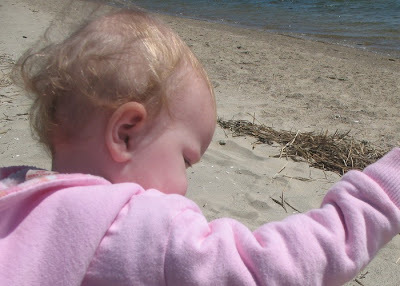 Here's a darling photo of Miss Savi at the beach. Precious picture! Heather, it is wonderful that you can take her to enjoy the ocean. I miss the beach so much! I have been puttering around the house this morning, packing and unpacking (to balance my suitcase). I put new batteries in my camera, and also packed two extra ones. I don't need to say why! Gotta run - I need to catch up on things at work before I leave Thursday afternoon. TTFN and have a nice Tuesday! Day 1184 - Monday, but NEXT Monday is a Holiday! 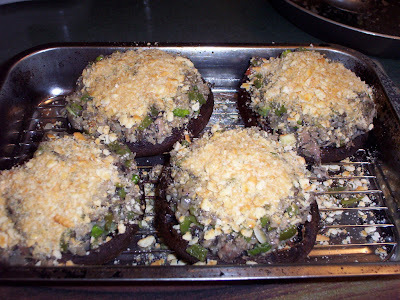 You are looking at my 'Boudin Stuffed Portabello Mushrooms' before I put them in the oven last night. Do you know what Boudin is? It is a spicy pork and rice cajun sausage. (Taking the Boudin OUT of the casing was the hardest part of the preparation). I read a recipe once that talked about stuffing green peppers with a Boudin based stuffing, so I applied that concept to my mushrooms. Charlie and I went to see Star Trek in the IMAX theatre at Opry Mills. Bottom line - awesome. Survivor Finale? Maybe I shouldn't spoil the news until Nancy has seen it. Nancy - did you watch it yet? Anyway - for once, my favorite person WON! Yahoo! Gotta go to work, but have a great Monday and I'll be in New England very soon! Day 1183 - Girl power! A filly wins the Preakness! Did you watch the Preakness race yesterday? It was awesome! Rachel Alexandra became the first filly to win the preakness since 1924. You go, girl! She was number 13 - a number I would never want to have in a race! 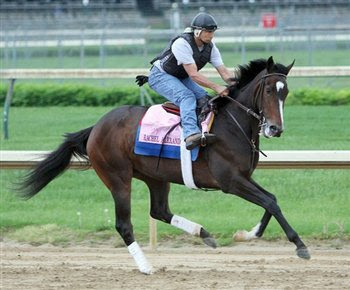 Rachel Alexandra was ridden by Calvin Borel. Calvin Borel is the same jockey who rode Mine that Bird in the Kentucky Derby! Go, Calvin! Calvin became the first jockey to win TWO legs of the triple crown on TWO different horses. Another shocker - ten days ago, somebody else owned Rachel Alexandra, and she was NOT scheduled to run in the Preakness at all! Jess Jackson - the founder of Kendall-Jackson winery (and a billionaire) had seen Rachel run the Kentucky Oaks race on television May 1st, and arranged a deal. Overnight, she belonged to Jackson and partner Hal McCormick and was in the Preakness discussion. Gotta go - Charlie and I are going to work out, then see the new Star Trek movie at the IMAX in Nashville. Have a nice Sunday! Day 1182 - Ahhhh, the weekend is here! We are about to get thunderstorms here, so I'd better 'type and go' and shut down the computer. Miss Savannah is getting some attitude in these pictures, isn't she? 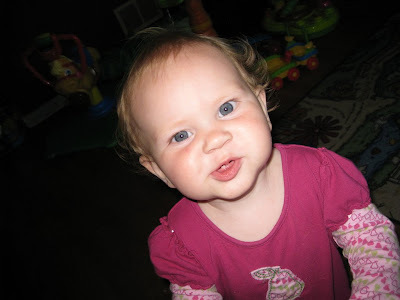 This is what Heather calls her 'monkey face'. Too cute! If it is storming, I can't go to water aerobics because every time there is lightning we have to get out of the pool for half an hour. (of course, last year they didn't have that policy and I remember plenty of times when I was in the pool during lightning - I guess I'd rather not take the chance). I'm already packing for my Memorial Weekend trip to New England, and the weekend after that is when Cheryl is coming to visit. 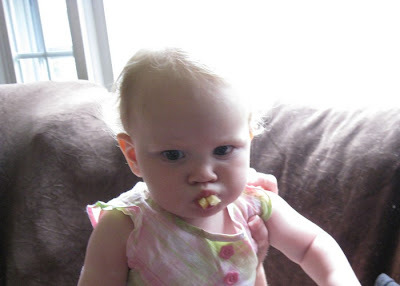 Heather - please explain in the comments why she jumped up on the couch with her mouth full of fries! If you know about the 'free KFC grilled chicken dinner' coupon promotion (aka fiasco), you also know that in many areas, they are not honoring the coupon, and you have to get a rain check. I tried to use my coupon, unsuccessfully. I didn't even get the raincheck, because I would have had to go inside and fill out a form, and have the raincheck mailed to me. I wasn't interested in giving out my address, thank you very much. Gotta run, I'm late! Have a nice Friday and a week from today I'll be in New England! Hey gang - had work issues this morning, so no blog. Apologies and have a nice day! Happy Birthday today to my cousin Cathy, who is recuperating from a hip replacement operation. Get well soon! I sent her a funny card. 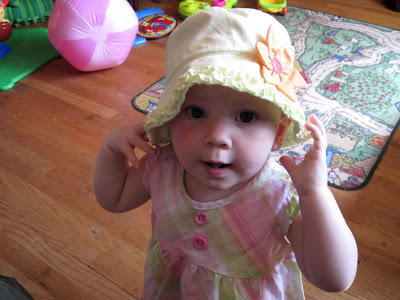 I think Savannah was about to take this hat OFF her head, but got distracted by the camera. I woke up this morning to Pat Boone singing 'Love letters in the Sand' in my head. Do YOU have music running through your head most of the time? Or do you have to PUT it there with an i-pod (or whatever musical device is attached to you). I'm running a tad late this morning, trying to find JUST the right sweater for work today. It had to be warm enough for indoor air conditioning, and cool enough for outdoors being 75-80. Kind of a challenge, but with my vast and overflowing closet, I succeeded. Anyway - more tomorrow, have a nice Wednesday, and TTFN! 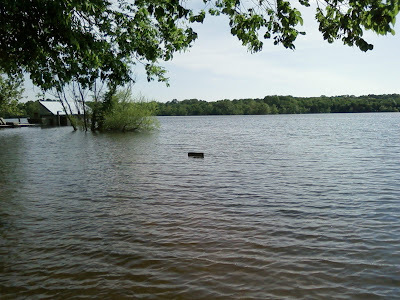 Roaming Blog Reporter Buddy Joe (rumored to be a distant relative of Jimmy Olsen - James Bartholomew Olsen if you want his full name...) provided this photo of Percy Priest Lake - that black speck in the center is a submerged 'no swimming' sign! The Percy Priest Lake area also is home to a water park named 'Nashville Shores'. They are scheduled to open this weekend, but the entire beach and picnic area is submerged. They are discounting tickets by $10, and still opening up the pools and water park area. I 'think' we might have had a rain free day yesterday, though it might have rained a bit in the morning. We are NOT supposed to have rain today. Whoo Hoo! Two days in a row! TTFN and have a DRY Tuesday! Yes, it's true. It's Monday already. Yes, it's true. May is running away from us already. Here's a picture that I named 'Savi Ninja' - she looks like she's either a little ninja turtle, or waving into the camera. Charlie and I went to see 'Wolverine' (the latest X-men movie) yesterday. The critics haven't been too receptive of the movie - but I liked it as well as any of them, probably more than the last one. We want to see the new 'Star Trek' as well. If you missed my mentioning it - we also hit the 'Cajun Steamer' for lunch out on Saturday. Gotta go to WORK - it's MONDAY! TTFN! Day 1176 - Happy Mothers Day! 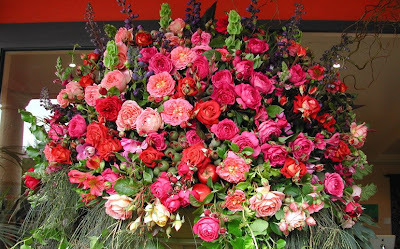 Greetings, Bloggy Mothers Day Celebrants! Happy Mothers Day to all the 'Moms', 'Mammas', 'Mothers', as well as the stepmothers, grandmothers and great-grandmothers too! Hope you have a wonderful Mothers Day and do something special for YOU today! Mom - I hope my card (which had a single rose surrounded by SNOW on it) arrived! If you didn't read the blog comments yesterday - Happy Belated Birthday yesterday to TWO of my aunts (sisters but not twins) - our own famous Aunt Nancy, and Aunt Mary Ann! How unusual to have two children several years apart but born on the same day! We are planning to celebrate their birthdays in Nashville next year on Mothers Day weekend. What fun! Charlie and I had Mothers Day lunch yesterday (with Buddy Joe) at Cajun Steamer - and had our usual delicious feast. One note - they set up tables for a party of THIRTY people while we were there. Cajun Steamer is a small place, with limited seating. We had our lunch, other customers were waiting for tables, and only about half of the thirty people had arrived. TTFN and Happy Mothers Day! Day 1175 - That's a lotta DAM water! These are 'Dam awesome' pictures Charlie (blog reporter!) 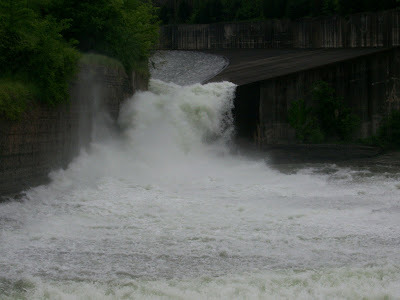 took yesterday at Tims Ford Dam. 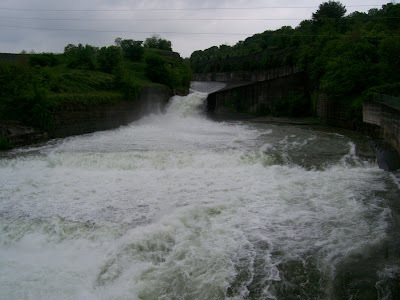 This is water being released out of the DAM spillway - and BOY IS IT EVER SPILLING! In case you don't know, Tennessee generates a lot of electric power with water (hydroelectric), and the TVA (Tennessee Valley Authority) manages the dams and waterways in Tennessee. Blog reporter Charlie also noted that many of the fishing pier/docks are underwater. Nothing like a good spring flood, eh? Gotta go to water aerobics! TTFN and have a nice Mothers Day Eve!!! Here's another great 'tooth' photo - Savi looks like she enjoys having the camera right in her face! It's Friday already - where did the week GO? I'll never catch up. There is thunder and lightning outside at the moment, but no rain yet. We had one whole day yesterday with no rain - it was nice to see some blue sky. So - how many daydreams do YOU have while you are dreaming? TTFN, have a great Friday and a great Mothers Day weekend! Day 1173 - Of New Choppers and the Newly Chopped! 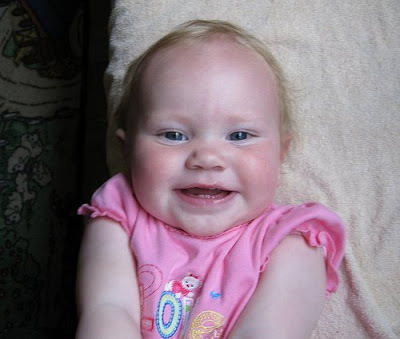 Look at our darling girl with SO MANY TEETH! Nice choppers, Savannah! Teeth make her look more 'grown up', don't they? And what a big smile! Heather, you must have been tickling her. Speaking of choppers - my girl Allison got voted out last night on American Idol! Allison SHOULD have been in the final three (Kris should have left the show instead). She is an outstanding singer and just turned 17, but I didn't vote so I take full responsibility for it. Anyway - I still expect my boy Adam to win it ALL, and he deserves to - he has been a step above anyone else this season. But I did want Allison to enjoy being in the top three. 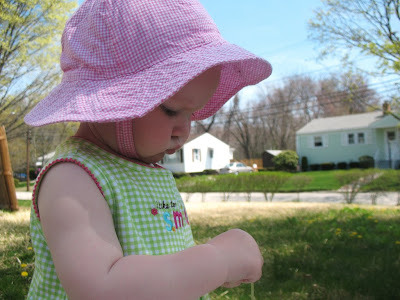 Here is a sweet picture of Savannah studying a dandelion - I like the way her cheeks puff out around the strap of the hat! Too cute! 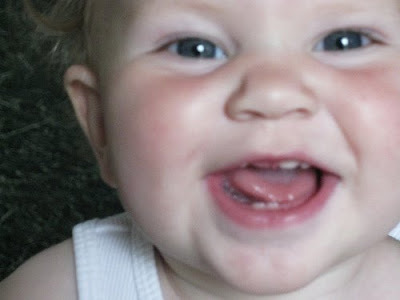 Heather tells me she is getting a LOT of teeth - I can't wait to see them later this month during Memorial Weekend! Hey - sorry gang, I just noticed the time and need to make this short. Day 1171 - Cinco De Mayo! Hola, Bloggy Cinco el Drinko's! I think I said that last year on May 5th. Do you have any Cinco De Mayo celebration plans? I heard that he WILLINGLY left the livestock trailer on Saturday and enjoys their barn. He already has a pal - their dog, who likes him. I think that's nice. I'll hear more about how he's doing today, my coworker had the day off yesterday. It's Monday already - time to get up and go to work! 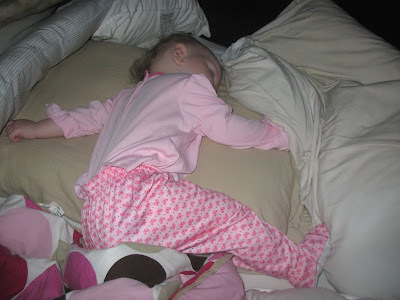 Savannah's got the right idea - sprawled out and sleeping away. I'll find out today how he's doing. Yesterday, Charlie and I took a long drive to go survey some of the local rivers that are flooding - some of them way over their banks and into nearby fields. Lo and behold, we ended up at Papa Boudreauxs for gumbo after that! We saw two closed bridges, and a LOT of muddy, chocolate brown, fast flowing water. 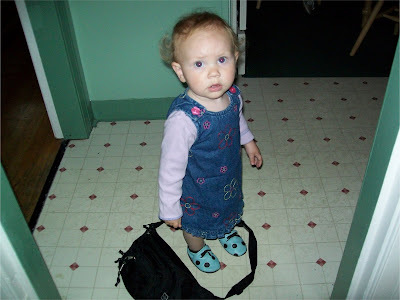 Did I bring the camera for the blog? No. Drat! I tried to find a photo just now but was unsuccessful... I did see one on the weather channel yesterday morning from Columbia. Gotta go to work! TTFN and have a nice Monday! Day 1168 - Farewell, homeless one! 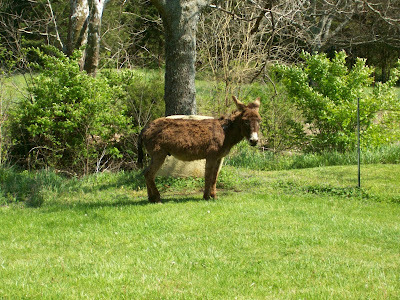 We have had flooding rain, so the yard, barnyard, etc is solid mud, which didn't help things. However - not easily, not willingly, but our beloved 'Old Don Q' went on his way with his new adoptive family around 1:30 this afternoon. I HOPE with all of my heart that they like him and he reciprocates! Day 1167 - Happy May! You know what to do - march in a circle chanting 'Fri-day! Fri-day! Fri-day!' If possible, march around a Maypole today, or just pretend. 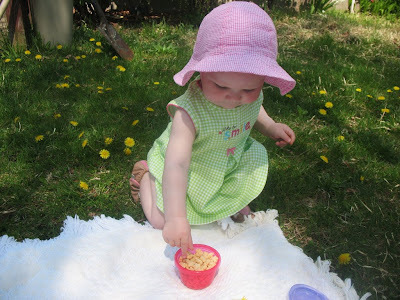 Look at this sweet picture of Savannah having a little picnic of cereal puffs outdoors! Good coordination, Savi... She's on one knee and balancing. Gee - the dandelions here have already gone by, but I don't miss them. I had the strangest dreams last night! I dreamed that I went to this 'theme' place in a mall or hotel with several other people. We were looking for a place to go dancing, but this worked out fine. One big room was the 'wild wild west' - complete with big rocks and a campfire ring. You dressed up in costumes and 'roamed the indoor prairie'. The room next door to it was a different theme, with different costumes. The funny thing about the dream was that I already HAD western wear on, and didn't really need to change clothes. Does that mean I'm OK, just the way I am? I'll take that as a yes.